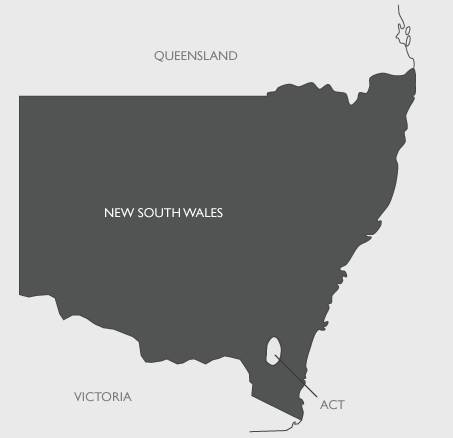 If one state epitomises everything about Australia it's New South Wales (NSW). Situated on the east coast of Australia, New South Wales offers the spectacular sights of Australia's most iconic capital city, Sydney, and attractions ranging all the way from the year-round sunny beaches of Byron Bay to the chilly Snowy Mountains, home to Australia's highest peaks. First stop for most in NSW is undoubtedly the world-famous city of Sydney. A must-do on any Aussie itinerary, Sydney boasts stunning natural attributes and well-known attractions such as the Sydney Harbour Bridge and Opera House. A cosmopolitan city brimming with hip places to eat and drink, beachside Bondi is one suburb that has it all. Australia's most famous stretch of sand draws surfers, swimmers and sunbathers from around the world. Grab your camera and take the cliff-side walk from here to Coogee to catch expansive views across the ocean. In the shopping heart of the CBD, you'll find famous brands and a bustling city atmosphere bound by Sydney Harbour, Circular Quay and the historic Rocks area. Get off the tourist trail a little bit to explore local beaches like Manly, Clovelly and Tamarama, or discover the bars and boutiques in fashionable inner-city suburbs including Newtown, Surry Hills and Darlinghurst. About an hour from Sydney are many short escapes, with the Blue Mountains and Hunter Valley regions home to stunning lookouts and scenic nature walks. The Hunter Valley is also a popular destination for foodies and wine buffs, with its numerous award-winning wineries and artisan gourmet finds to sample your way through. While you're in the area, check out the spectacular beaches in the much underrated Newcastle. Close to the sparse bushland of the Australian Capital Territory, the Southern Highlands region of NSW with rolling green lawns, stately houses and tree-lined roads reminiscent of the English countryside. Here, you'll find national parks, quaint country towns and boutique festivals staged at various times of the year. During the winter months, the Snowy Mountains are blanketed in white powder offering optimal snow conditions for skiers and snowboarders. Don't say it out loud or the secret will get it out, but this part of the country is just as worth a visit in summer months when the mountains provide a cool getaway and ample wildlife watching opportunities. Two others places in NSW to spot native wildlife are isolated islands Norfolk Island and Lord Howe Island. Both located hundreds of kilometres off the coastline, you'll need to take a flight from Sydney to get there but the journey is well worth the trip, with both Norfolk and Lord Howe claiming a mention in World Heritage lists. For many people, no visit to NSW is complete without hitting the Pacific Highway and heading north. The bannana growing area of Coffs Harbour and the Northern Rivers region both offer a warm climate year round, while the most popular town in NSW's northern corner is definitely Byron Bay. A long-time favourite destination for backpackers and alternative lifestyle seekers, these days Byron Bay and surrounding towns such as Bangalow are attracting a wider audience thanks to its increasing supply of boutique and luxury accommodation. Sheltered by lush greenery and boasting an attractive laidback feel, Byron Bay offers a range of cultural, lifestyle and holiday activities for the whole family. You might not know it looking at most travel brochures but NSW also has an inland Outback area. Historic mining towns of Lightning Ridge and Broken Hill are where arid land and wide, open spaces offer you a taste of frontier country. From the Outback to the beach and the city to the mountains, there's a fabulous NSW holiday just waiting for you to enjoy any time of the year.